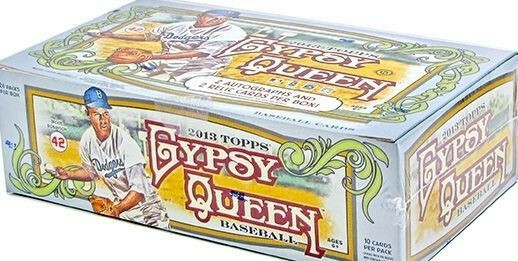 Factory Sealed topps Gypsy Queen Baseball Hobby Box mit 24 Packs a 10 Cards per Pack. 2 Autogramme und 2 Relic Cards per Box und eine 10-Card Mini Box !! Produktinformationen "2013 Topps Gypsy Queen Baseball Hobby Box"
& Mini Button cards from the top players this year! On-card autographs of veterans, rookies and retired stars. 2 PER HOBBY BOX! A selection of current and retired pitchers that have thrown a no-hitter. NEW! to be this year's Gypsy King and Gypsy Queen. We will select one Gypsy King and one Gypsy Queen to be featured with an autographed card in this year's product. Silver Framed Parallel Sequentially numbered 1/1. Hoby Only NEW! (300 subjects): Veterans, rookies and retired players. (50 subjects) 1:4. Additional subjects from the first 300. Weiterführende Links zu "2013 Topps Gypsy Queen Baseball Hobby Box"
Fanbewertungen für "2013 Topps Gypsy Queen Baseball Hobby Box"